Located on the tropical island of Bora Bora, the beachfront St Regis Resort offers 2 swimming pools, 2 bars, 4 restaurants and a luxurious day spa. All accommodation boasts a balcony offering panoramic views of the lagoon or surrounding islands. 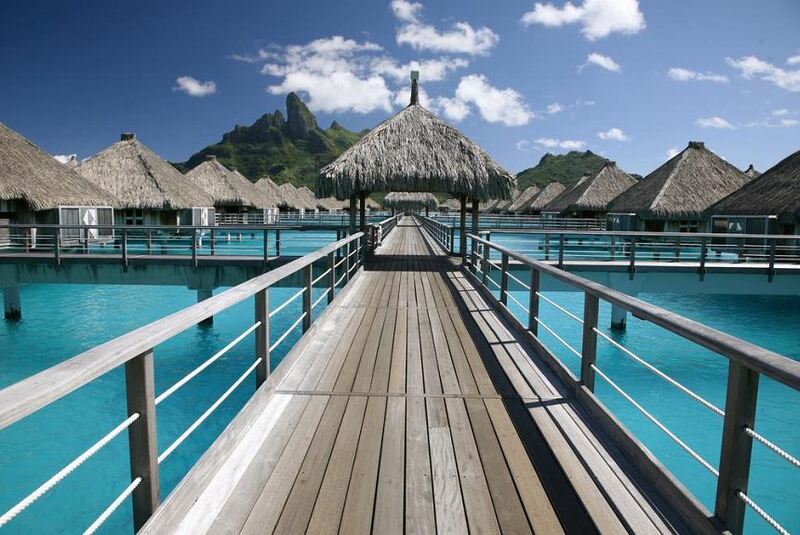 The St Regis Bora Bora Resort is a 10-minute drive from Mont Otemanu and Mont Pahia. It is a 15-minute boat transfer from Bora Bora Airport. Vaitape Village can be reached via a 20-minute boat and car journey. The air-conditioned villas feature hand-carved Polynesian sculptures, exotic wooden décor and an Italian-marble bathroom with a rain shower and bathtub. Some villas offer a private plunge pool, a hot tub or an outdoor shower. Suspended over the blue waters, Le Lagoon Restaurant offers Polynesian cuisine and views of Mount Otemanu. Te-Pahu serves Mediterranean-style grilled dishes, while Sushi Take Restaurant offers sushi, seafood and sake. Far Niente boasts Italian cuisine. Miri Miri Spa boasts massage services, a sauna, a hammam.